I love facial sheet masks for their ease and convenience. They provide care & moisture for the skin but eliminate the hassle that comes with using clay & gel-based masks. Dress Me facial masks are ideal for common skin problems; skins that are dehydrated, oily, pigmented, dull and lost of lustre. The hassle-free skin treatment takes only fifteen minutes to complete and is suitable for daily usage. The effective and essential natural ingredients used in the masks are found in many skin care products. The ingredients are Natto, Trehalose, Helichrysum Agustigolium, Spriarea Ulmaria, Gigawhite, Ginkgo Biloba and Vitis Vinifera (Grape) Fruit. 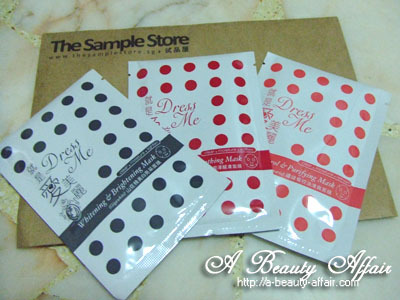 You will be spoilt for choice with the range of Dress Me facial masks available! However, I'd only tried out 2 out of the 3 so far. I decided to use the Oil Control & Purifying Mask as my period was approaching and my skin felt like it needed to detox. I have combination skin where the T-zone is more prone to oiliness. The facial mask felt cool against my skin even though I did not leave it in the refrigerator. It had just the right amount of essence and there weren't any dripping from my mask. Some masks do that and makes mask time quite a mess. After leaving it on for 15 minutes, I removed the mask to reveal skin that looks brightened. No rinsing is required at all, my skin starts to feel soft and smooth after awhile. The Whitening & Brightening Mask was just as great! 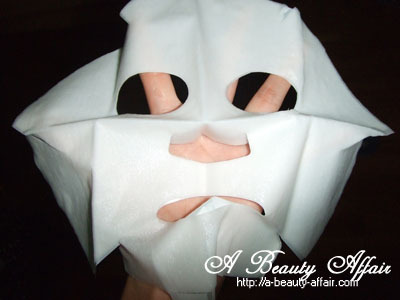 Like the first one I'd tried, this one also leaves your skin looking brighter and glowy after masking. I also like that they all are not heavily-scented. My skin also felt moisturized after this indulging little treat, I'm glad with my choice of masks for this trial. Also visit their website for more information, Dress Me Facial Masks!